Delonghi makes a wide variety of high quality coffee makers, ranging from simple drip brew makers to amazing espresso machines. Although each model or type of machine works a little differently, learning how to work a Delonghi coffee maker is very simple. With easy to use buttons and various removable parts, making an amazing cup of coffee in a Delonghi coffee maker is one of the easiest tasks you will ever find. The first step in preparing for a pot of coffee is adding water to the machine, unless of course it is a Delonghi that is already set up to a water line. If it’s not, you need to manually add the water, which can be measured out by using the coffee pot. 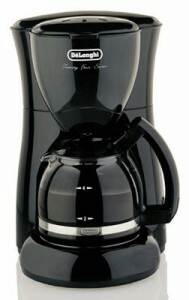 After the desired amount of water is measured, the lid of the coffee maker must be opened and the water poured into the inside of the coffee maker. Simple enough. You can leave the lid open, since the next step is to load the coffee into the coffee maker. It has a removable coffee basket for convenience, so you can take it out and place your coffee filter and coffee right inside. The basket should then be placed back in the coffee maker, the lid closed, and the preparation is complete. Because it is more sophisticated than typical drip brew coffee makers, learning how to work a Delonghi coffee maker does require a little practice. Rather than just being able to press the on button for the coffee maker to start working, there are actually various settings that can be used on this type of coffee machine. Different settings for the temperature of the coffee as well as what time to have the coffee start brewing are included on most Delonghi coffee makers, so it is important to read each button to learn how to make a pot of coffee the way you like it. One great addition that other coffee makers don’t have is the aroma button, which will brew your pot of coffee in a unique way that enhances and increases the flavor of your coffee. Pushing the aroma button will activate the different brewing process, and your entire home will smell like sweet coffee in no time. One of the best components of a Delonghi coffee maker is the pot, since it actually keeps your coffee warm much longer than a regular glass coffee pot. Because coffee can start to bake and actually taste bitter after sitting on the burner for a long time, a Delonghi coffee maker avoids this by keeping the coffee warm in an extremely insulated pot. You can turn off the burner to save electricity, yet your coffee will still stay warm without getting cooked. Great feature. If you do, however, decide to leave the burner on to keep your coffee as warm as possible, all Delonghi coffee makers have an automatic shut off feature. After about two hours of being left on, the coffee maker will turn off the burner to avoid any accidents or injuries. Nothing needs to be done to activate the auto shut off feature, since it is automatic in every kind of Delonghi coffee maker. Even though knowing how to work a Delonghi coffee maker is a little more difficult than a small drip brew coffee maker, it is still simple to make an amazing pot of coffee. With simple controls and easy to remove parts, preparing for and actually brewing a pot of coffee only takes a few simple steps. Even the additional features such as the insulated coffee pot and aroma brew setting are simple to use and understand, and you can learn to make a pot of coffee every morning with no trouble at all. How can I run my coffee machine of DeLonghi (BAR14F) in hindi? Do I press the aroma button first and then the on/off button?